His smile said it all. A boy in my group had accomplished his final weekly goal of cooking a meal for his family. I could tell he was excited when he set this goal the previous week. At the beginning of our time together, he didn’t know how to chop a vegetable or measure ingredients. Now he had made an entire meal and he was so proud (as was his mom). I am confident now that our six weeks together have made a real difference in his life. This is the power of Family Dinners. It provides life skills necessary to live a positive, healthy life while increasing the bond of a family. It teaches them that cooking together is fun and is, in so many ways, more beneficial than the alternative. 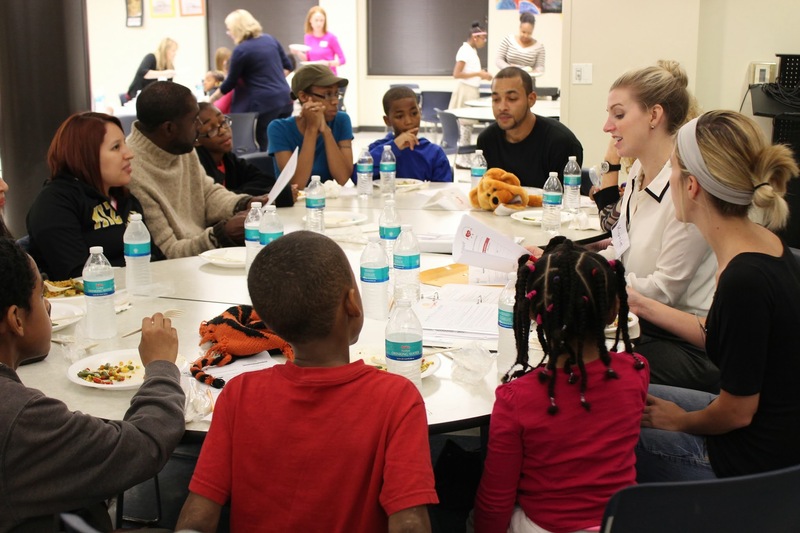 Family Dinners is component of the Junior League of Kansas City, Missouri’s signature community impact program, Healthy U. The goal of Healthy U is to build a healthier community through programs focused on nutrition and undernourishment, healthy lifestyles and fitness. Our society scarily seems to becoming more and more reliant on fast food. We are constantly inundated with commercials, and you can’t drive down a major street without seeing at least 10 fast food restaurants. Oh, but isn’t it easier to just grab that for dinner? No, it isn’t worth it! Our children learn from us, and if we make this a habit then they will grow up thinking it is the norm. 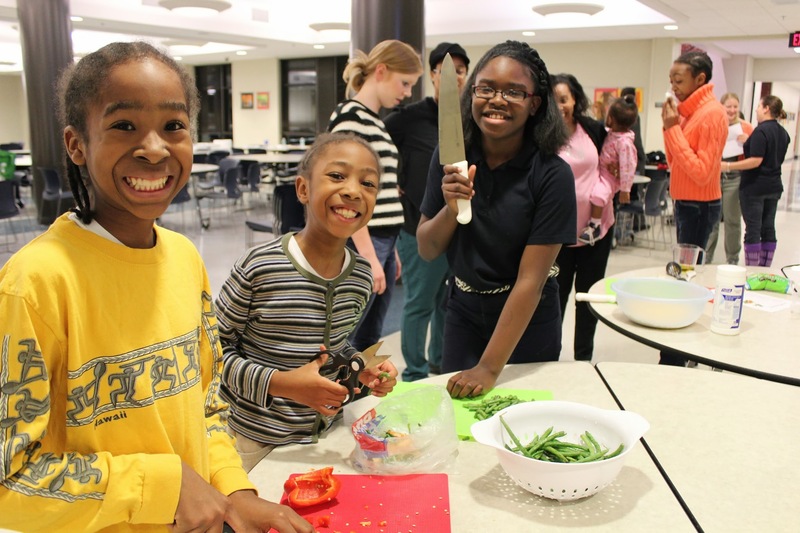 Family Dinners combats this way of thinking by providing families with the tools they need to succeed in the kitchen. Recently, there was a Wall Street Journal article entitled, “Chef Fabio Trabocchi’s Tricks for Teaching Kids to Cook. How to Teach Culinary Skills to Even Young Children.” Trabocchi says one of the easiest ways to teach children good eating habits is to cook with them. He goes further to say, “If you don’t cook at all with them, they might assume that everything comes from a package that you find in the supermarket.” This closely relates to a fundamental goal of Family Dinners: teach healthy eating habits that will last a lifetime. A key reason for getting kids involved in cooking is that they are much more likely to eat something that they have helped create. When cooking with his family, Mr. Trabocchi delegates a task to each child. This gives everyone involved a sense of community and the child takes pride in their specific job. “It’s nice for them when we can say, once we sit down at the table, that ‘This is the dish that Luca or Alice prepared’; therefore, they’re going to eat it because they’ve been involved in it.” There were several instances at our Family Dinners table where parents were shocked to see their child trying certain dishes, claiming they never would have tried it at home. This is largely attributable to the fact that the child was involved in its making. Since starting my placement with Family Dinners, my 2 year old has been helping me measure and pour ingredients for our meals. She loves it and it really is a great bonding time for us. It may take a little longer and our floors might be messier but it’s time well spent. I encourage all of our Junior League members with kids to get them cooking in the kitchen as well! Click here to view the Wall Street Journal article mentioned above. Family members share in the preparation and cooking of meals during the weekly Family Dinner sessions. 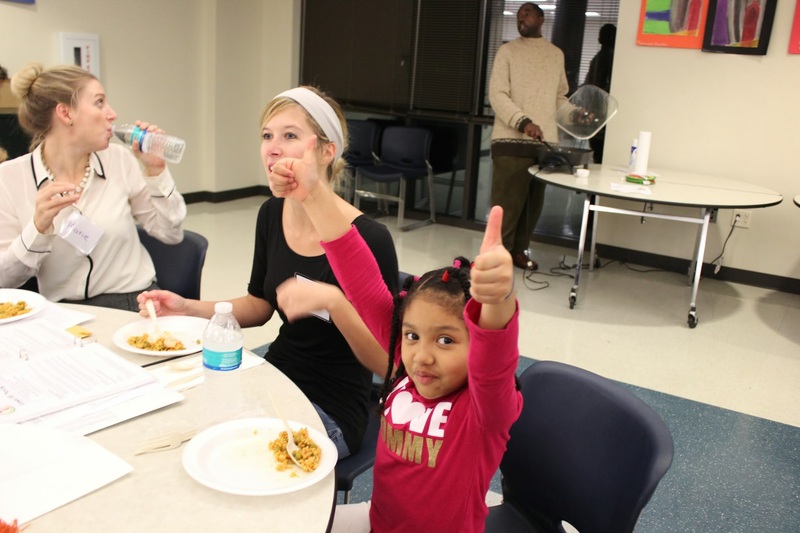 One young Family Dinner participant gave the meal two thumbs-up! After an evening discussing how to make healthy eating choices and prepare healthy meals, families are sent home with a bag of groceries containing the ingredients necessary to recreate the same meal at home. 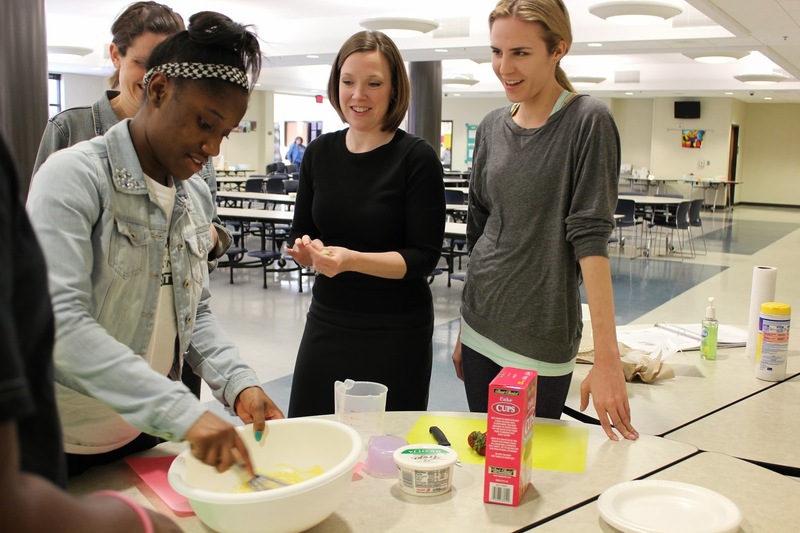 Junior League of Kansas City, Missouri members discuss healthy food choices with the families providing information for parents and children alike. League members work with families during the six week course and provide encouragement for participants of all ages. This entry was posted on November 19, 2013 by JLKCMO in Community Impact, HealthyU and tagged childhood obesity prevention, Community Impact, Family Dinners, healthy lifestyle, Healthy U, Junior League of Kansas City, nutrition education, Voluntarism, women building better communities, women in leadership.